Plastic has brought immense benefits to the society in a number of ways. A number of industries have been benefitted by plastic. In actuality, plastic has helped aeronautics technology take massive steps forward over the past 50 years, including advancements in satellites, shuttles, aircraft, and missiles. In addition, pharmaceuticals industry, the building and construction, electronics, packaging, and transportation industries have all benefited greatly from plastic. Plastic is superior, light, sturdy and economical to produce. There are numerous benefits of using plastic. It does not decay but it can instead be recycled. Unlike aluminium cans, plastic bottles can be reused and stored for a longer period of time. Plastic is usually unbreakable and it is transparent. It's light-weight and odourless. Plastics are oil and gas based, and consumes less than four per cent of our oil and gas reserves. To sum up modern day advancement is highly dependable on plastic industry. Plastic has emerged as one of the most important invention of mankind with utmost tendency to grow. Thorough knowledge of profitable plastic industry can help you to get deeper penetration and reap advantage. Besides you can also get better understanding of plastic industry if you read on profitable plastic profiles. So that if you try your hands you are altogether not perplexed. This book gives you a brief summary of profitable plastic profiles. Let’s talk about the introductory chapter that is on Disposable Plastic Syringes, Needles & Needle Tube Plant. With the development of pharmaceutical industries the use of syringes and disposable needles has also witnessed an increase in demand. This means that the projects aims at manufacturing each and every components of a syringe within the plant and assemble them into a complete syringe for sale under its own reliable brand name. Similarly the other chapters of the book like Electroplating of Plastics, Disposable Plastic Cups and Glass, Polyester Resin Etc deal in topics with great detail. The book provides you with comprehensive information on installation of entire equipments needed for an integrated Disposable syringe plant. The book aims to provide you with many other profitable profiles, the manufacturing process, and details of present manufacturer of the profile dealt. NOTE: - The use of the ISI Certification Mark is governed by the provisions of the Indian Standards Institution (Certification Marks) Act and the Rules and Regulations made thereunder. The ISI Mark on products covered by an Indian Standard conveys the assurance that they have been produced to comply with the requirements of that standard under a well-defined system of inspection, testing and quality control which is devised and supervised by ISI and operated by the producer. ISI marked products are also continuously checked by ISI for conformity to that standard as a further safeguard. Details of conditions under which a licence for the use of the ISI Certification Mark may be granted to manufacturers or processors, may be obtained from the Indian Standards Institution. Syringe barrel & piston alongwith needle-base and needle cover etc., are the injection moulded items that go into the assembly of a complete syringes injection moulding of plastic components is effected in a properly designed & constructed mould. 2. M/s. Apollo Surgical Co. 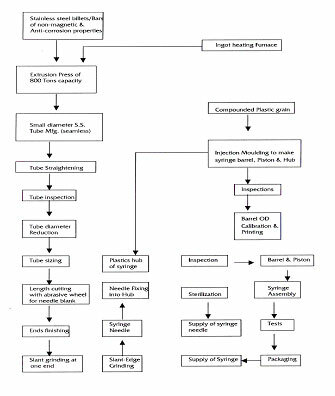 The various components of Hypodermic needle shall be made from the following materials shown against each. - The Hub shall be made from free cutting brass wire. - Stillete - Stillete shall be hard drawn brass wire or stainless steel wire and supplied one for each needle. The needles may have other diameter length combination as agreed to between the purchaser and the supplier. The nominal diameter of the needle shall be designated by a number closely corresponding to the outside diameter of the acannula. The needle tube is seamless. These tubes are manufactured by extrusion process. The size of the tubes used for the manufacturing of needles have a range of 14 swg to 26 swg. Seamless stainless steel tubes are purchased from the market and then it is cut into the required length. After cutting the edges are smoothened by grinding operations. After the smooth grinding one end of the needle tube is ground and into a slanting shape and the slanting tip is also subjected to smooth grinding. All these operations are done with the help of automatic needle making m/c with abrasive cut off system. After all these operations, the needle tube is ready for fixing the hub. The manufacturing process of hub is very simple. For this purpose injection moulding is used. The process can be automatic or semiautomatic. The plastic material i.e. HDPE Compound with all additives (like plasticizers, stabilizer, fillers) are fed into the injection moulding machine. The moulds which are used in the injection-moulding machine have the shape of the hub. The plastic compound is heated and the required shape is obtained in the molten stage, followed by cooling at a proper rate. Then the finished needle tube is fixed to the hub, which is in the hot stage. The hub is properly fixed due to the shrinkage occurred in the hub when it is cooled. After fixing, the needle is sterilized in the sterilizing unit. The sterilized needle is put into the plastic cap and then is packed in the plastic covers. Then the needle is ready for supply. For needle sterilization gaseous sterilants are used, because plastic hub cannot withstand the temperatures and moisture of steam. Sterilization is exposure to radiation. The main practical requirement is that the gas selected should allow safe handling and that its residues should volatilize relatively quickly if absorbed by components of the arbode sterilized. Ethylene oxide satisfies most of these requirements and as the most frequent choice. The ethylene oxide used for sterilization is in diluted form. The disposable needles being hollow are made from stainless steel drawn capillary tube (cannula). The manufacture of drawn capillary tube is a medium sized unit while the disposable needle making out of this tube is a small unit and is reserved exclusively for small scale. The needle tube is made from seamless stainless steel drawn tubing. The needle tubes are imported from U.K., West Germany, U.S.A., Switzerland and Japan. The supplies are usually in length of 0.5 m to 3 meter. A fresh Disposable plastic Syringes must be used for each and individual injection. It is essential to keep plastic syringes for injection from those used for aspiration. Do not talk, cough, or squeeze over a sterile plastic syringes. Sterile plastic syringes must be placed in sterile conditions. The manufacturing process involves die design, material selection, blending of plastic resins with other additives, mould/die construction, heat treatment and inspection, before use on the automatic injection moulding m/c. These details have already been described earlier. However, compounded to correct formulation plastic is used as a raw material in an injection moulding machine to form barrel, piston/plunger and needle cover of a disposable plastic syringe conforming to the specifications developed by Bureau of Indian Standards or other international standards. The injection mould barrel & piston is finished mechanically & calibrated to indicate quantity of injecting drug drown in the barrel. Finally, the plastic parts are tested as per given guidelines of international standards before safe packaging for despatch. 1. M/s. Core Healthcare Ltd.
2. M/s. Goldmine Polymers Ltd.
1. M/s. Hindustan Syringes & Medical Devices Ltd.
1. M/s. Cincinnati Milacron Pvt. Ltd.
1. M/s. Revex Plasticisers Pvt. Ltd.
1. M/s. D.C.M. Shriram Consolidated Ltd.
1. Total Land area 4000 sq.mts. 4. Acetone for hub surface preparation (cleaning) 40 litres @ Rs. 100/- per lit. 1. Term loans from Financial institutions (80.00 % of fixed capital) at @22.00% p.a rate of interest Rs.